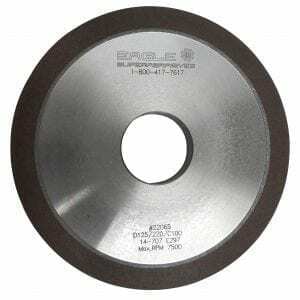 Carbide Grinding Wheel | Eagle Superabrasives Inc.
Eagle Superabrasives is a premier supplier of superabrasive supplies in the United States. We offer a wide variety of carbide grinding wheel choices that are ideal for working with carbides and other difficult to grind materials. With an extensive inventory of over 6,000 Diamond, CDX and CBN wheels in stock at our Hickory, NC location, we are able to ship ninety-percent of orders same-day. We can also fill custom orders in as little as seven days. Eagle Superabrasives manufactures and supplies numerous diamond wheels that can be made with various bonds on six different core materials. Our Pro Flute Series of heels, is our premier carbide grinding wheel. Our chemist and engineers have designed the Pro Flute series with a metal hybrid bond. As diamond chosen as the abrasive material with a 220 grit and an overall thickness of 3mm to 25mm, the Pro Flute series removes carbide quickly and cleanly with high precision.